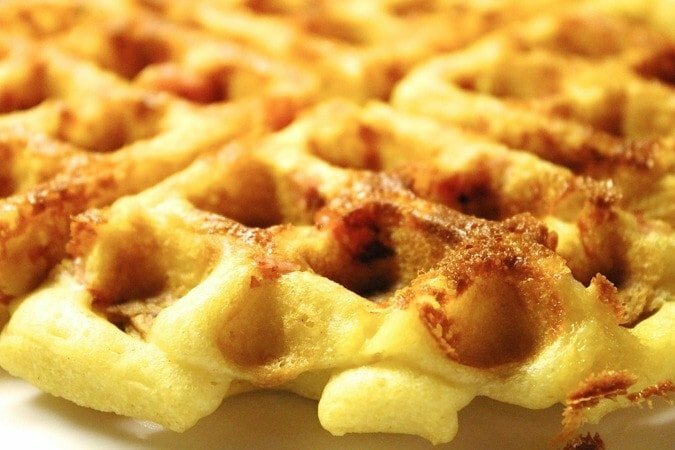 You are here: Home / Cuisine / American / Ham and Cheese Waffles: Savory, Sweet, Perfect. 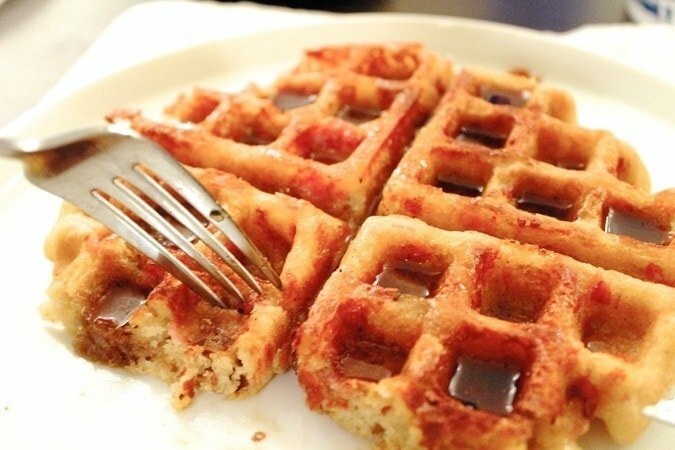 Ham and Cheese Waffles: Savory, Sweet, Perfect. A few weeks ago, Epicurious posted a collection of wild waffles and pancakes that just spoke to me. Making our meal plan last week full of healthy fresh things, I couldn’t help but beg O to let me make these suckers, and he so helplessly agreed, on the condition that I also make truffled eggs. 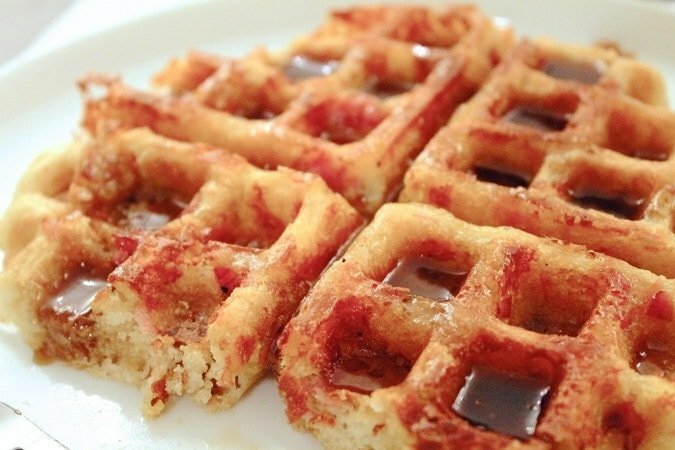 These waffles might seem bizarre, but truly they’re phenomenal. The cheese and ham add a bit of savory saltiness and depth to them, but they’re so perfectly balanced by real maple syrup (or perhaps a blueberry compote?). They’re dense but light (ever used soda water in waffle batter before, eh? ), salty but sweet, and so crispy. This happens so, so rarely to me, as I’m sure you’ve noticed, but I really just.. have no more words for these. All I can say is, please, God, make them immediately. Note: The recipe says it serves 12, but those waffles must be teensy. 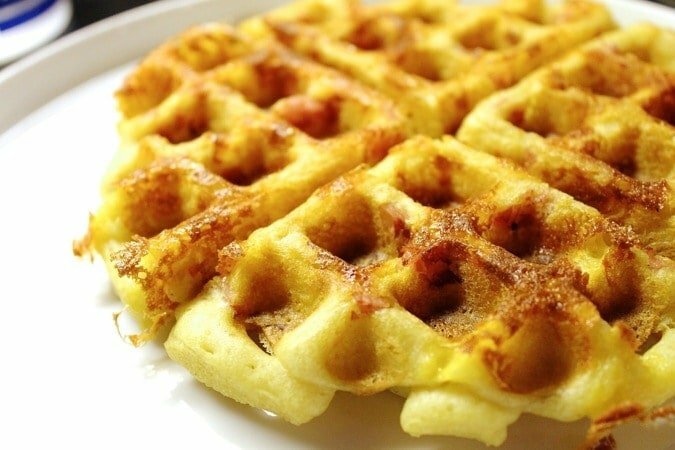 I say this recipe makes 6 regular Belgian waffles. 1. Preheat oven to 300°F. Heat waffle iron until very hot. 2. Whisk 1 3/4 cups flour, 1 tablespoon sugar, 2 teaspoons baking powder, 1 teaspoon baking soda, and 1 teaspoon kosher salt in a large bowl. 3. Using an electric mixer, beat 3 large egg whites in a medium bowl until medium-soft peaks form. 4. Whisk 3 large egg yolks, 1 cup (2 sticks) melted butter, 1 cup buttermilk, and 3/4 cup soda water in a medium bowl; gradually whisk into dry ingredients. 5. Fold in egg whites. Coat waffle iron with nonstick vegetable oil spray. 6. Pour batter onto iron, spreading it into corners (amount of batter needed will vary according to machine). 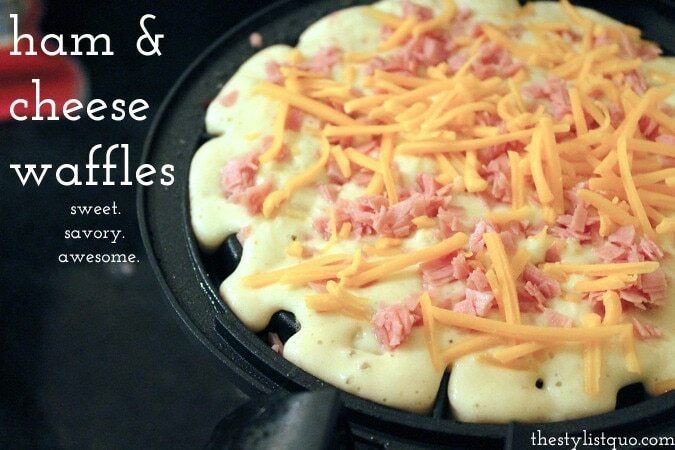 Scatter 1 rounded tablespoon thin strips of ham and 1 tablespoon shredded sharp white cheddar over each waffle. Cook until golden brown and cooked through. Transfer to a baking sheet; keep waffles warm in oven between batches. Serve with butter and warm maple syrup. Do your best to share.